When we started up our pool for the first time last year, we found that lots of parts that were removed for winterizing had walked off when the house was foreclosed on. We took care of the most urgent things to make the pool basically functional, but we're hoping to do more the bring the pool back to what it "should" be. I know the pool builder, but they are not superhelpful, other than wanting to charge me a $150 site visit fee to look at the pool, make a list of need parts, and order them and come back to install them. Not super interested in that. We'd prefer to order parts online as we managed the rest of start up all by reading here and watching youtube. 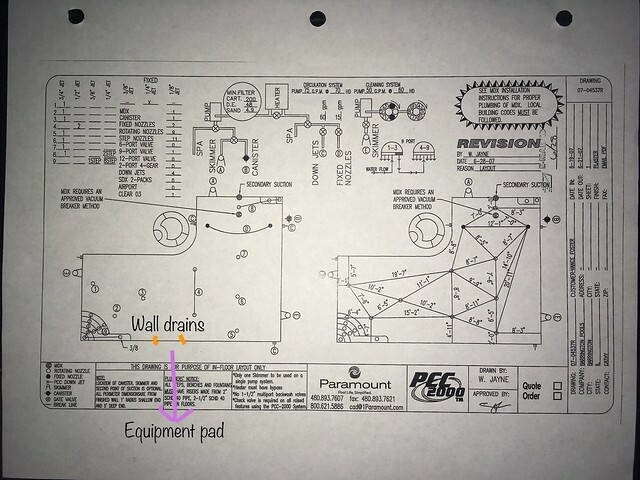 I DID get from Paramount a couple of diagrams for the infloor cleaning system (PCC2000), which very helpfully includes some info on the parts we need to replace to get that system to work. One of the things I'm not clear on are the downjets/returns for the pool. Right now, there's a bare, unthreaded pipe in the wall (looks like PVS was just cut flush with the plaster). I'm pretty sure that since it specifies a "downjet" that whatever goes in there should point down, not out like most eyeball returns. When looking at online paramount parts dealers, I find an aquajet which has a "slip" style return, and does seem to include a downjet eyeball. Paramount Aquadaptor II Slip Return That seems the most likely choice, but there is also a slip x Thread wall fitting? and the ijet, but that's for variable speed pumps, which I do not have. So, safe bet, or keep looking? Also, we have 2 sidewall suction areas without covers that remained didn't do anything last year, as part of the suction for the cleaning system (on it's own pump). I Think? I can just use the SDX covers, since the rings are in the walls, but do you guys have further input on what to look for to know if I can use the regular covers, vs. retro covers? Are you sure its not an overflow pipe? 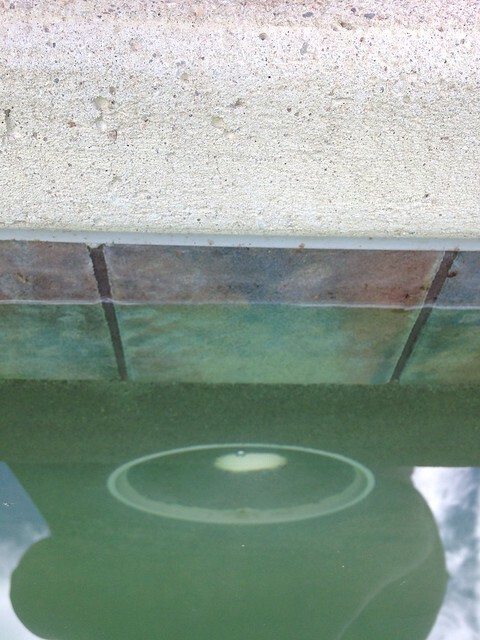 They often are just small pvc pipes up near the top of your pool. 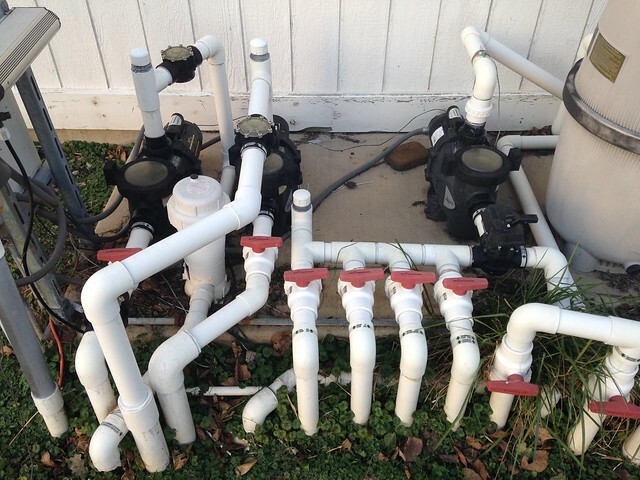 You might find a spot in the yard where the PVC pipe empties to. No these are for sure the returns. There are 4 of them, in the locations specified on the drawings, and we experience return flow from them last year. we just never put any type of cover/eye/whatever in them. I think we have an overflow in one of the skimmers. For the return down jets: Paramount should have these fittings available, not to the public though. Check to see if you have one of their "distributors" nearby for purchase. The slip type are for you, not the threaded. If you have a separate pump for the infloor cleaner, you should be drawing water for it through the skimmer. I would like to see your schematic for it. We install the PCC2000 and our systems don't draw water through wall fittings. Water is drawn through either the skimmer or the canister, or both (one through the other). Here's what paramount sent us. unfortunately it's not a straight out schematic, just a plan for the in floor layout. I indicated where the 2 extra wall drains are (the orange dots) and the direction of equipment pad from the pool. This is one of the two wall drains/suction areas that we assume are connected to the cleaner pump. The other one is about 3 feet to the side. pool is about 3.5 feet deep here. You should use the SDX Covers they are VGB compliant, or make sure any other covers you use are up to the newest codes.Replacement parts for In Floor Cleaning Systems including, Caretaker, Paramount, AA manufacturing, and Polaris. I was planning to use the sdx covers. I just don't know if I need the regular covers or the retro covers. Reading the labels on the 4 suction pipes to the filter pump, the one on the fight does say both skimmer and vacuum... but what are the wall fittings/drains for, that did nothing last year? They are connected - when we took the plugs out last summer, you could slap your hand over on fitting, and feel water move out of the other. They are designed to have drain cover. But I can't figure out their purpose. You need to get that cleaner outlet pipe fixed if you want to get the in-floor working or be able to map out the rest of the plumbing. Typically the pipes coming out in the wall would be water drawn for a water feature. This may be the "secondary suction" listed on the Paramount plan. The fact that they are plugged would suggest that they are maybe leaking and have been possibly abandoned? If that line is tied to the skimmer line and NOT valved to isolate it, AND it's leaking, then there is a problem. That suction line would not be able to be used until the line is repaired. If it is valved, then you could just shut off that line, make the repair to the broken cleaner line, and away you go. But i dont see a valve for that line. Ok, just got through looking through all the pics of the pool looks like you have got things going. I suppose you know by now why the heater was disconnected. Were all the plugs there when you moved in? or did you have the pool pressure tested when taking those pics? All the plugs were there when we moved in. From what we could tell, it was winterized by the pool builder/service in fall 2013, and never opened after that. We opened last summer DIY, and never did pressure test - we just took our chances! We unplugged almost everything, tested different valves to see what they controlled. The only things we did not unplug/turn valve was the wall plug for the autoleveler system (all the parts are missing) and the slide. The mysterious side wall drains we unplugged, but... they were functionless in any combination with the spa therapy jet pump, filter pump, or their respective valves. Since we knew the return pipe for the cleaner pump was busted, we never tried to open/dewinterize the module housing (modules are missing, there's antifreeze in the housing) or the pump. I think the secondary suction, based on what we see on pool itself - is a drain in the wall, and I think connected to the MDX in the floor. All the generic install drawings/videos of the MDX system showed a wall drain connected to it. I had wondered if the two mysterious wall drains near the steps might be a water feature, but never could figure what that might be, as none were indicated on the breaker panel or the Aqualink Controls. One of the other broken systems is the slide - both the slide itself is broken, as well as the pipe that we believe feeds water to the slide, which comes off the filter pump return line for the pool (and has a JVA to turn the slide water on and off... if it worked! ), so since that just comes off the filter pump, we didn't figure that it was pulling from the sidewall. My husband opened the housing for the heater, and said it looked like the the heat exchanger was corroded. We made the leap that since it was entirely disconnected, it was leaking. The control panel is still operable. We are planning to dig up the busted pipe attached to the cleaner up this spring, and repair it. I would love to get the entire pool back up and running as designed (minus the chlorinator, ozonator, and nature2 equipment), but that is about $10,000 in parts away, I figure. So, little bits every year, I guess. 10K just in parts??? Get a second quote! I could (if you were in my area) sell you a better than Jandy heater INSTALLED for less than half that. You don't need the ozone, don't want the natureII, and can probably get your existing chlorinator going again. If you couldn't, a simple erosion feeder is about 100 dollars. You mentioned winterizing the pool. I suppose there are company's out there that would, as part of the winterizing service, completely take the heater out of the plumbing and loop the system plumbing as had happened on your case, so it may be worth an inspection of that heater before you chuck it, based on initial evidence. I would put an expandable plug in that broken cleaner pipe before you start digging around it for the repair. 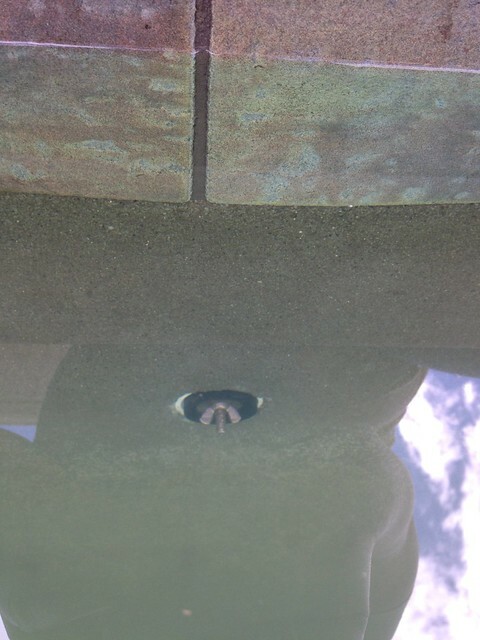 The 10,000 in parts is not just to pool heater - its missing popups, drain covers, hand rails, cleaner modules, plumbing repair, new slide, new heater, new pool cover (which is huge and has holes), fixing grout on some loose stones on the spa. So lots of little things. The neighbors told us the heater quit a couple years before the house was foreclosed, but that's an excellent point. It's worth a check to see what's really the problem. If we have the PB who closed come out, they may be able to tell us about it more than whats observable. Great idea for the plug. We should have done that last year - grass clipping, etc, have fallen in, and it was filled with antifreeze, and gave of a horrendous odor towards the end of the season.